Julian has more than 25 years’ experience in estate and succession planning and specialises in trusts and alternative structures. Julian qualified as a solicitor with Withers and then practised in London. 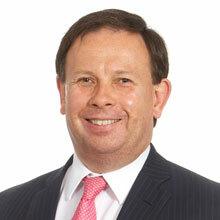 For a number of years he was a partner at Manches & Co and then moved to Jersey in 1997. Julian has been with Hawksford since 2002. Julian has extensive expertise and knowledge in providing fiduciary services to a wide range of clients including high net worth entrepreneurs and families with significant international business interests. He provides sensible advice on all issues of private wealth and wealth planning and has particular expertise in family governance, estate planning and succession planning, protecting a family’s wealth for the benefit of future generations. Julian is part of the executive team that heads up Hawksford Succession Planning, Hawksford Advisory and Hawksford Family Office. He is a member of Hawksford Group board and is one of the members that took part in the management buy-out of Rathbone Trust Company Jersey Limited in October 2008. He is a member of the Society of Trust and Estate Practitioners (STEP).